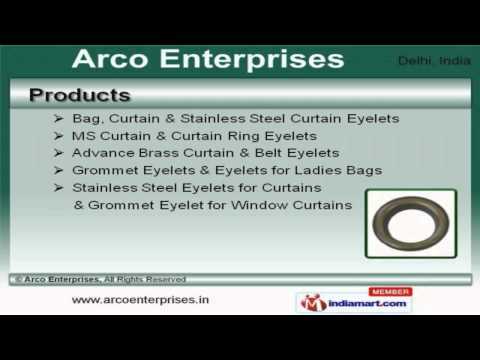 Welcome to Arco Enterprises, Manufacturer and Supplier of Industrial Eyelets. The company was established in the year 2005. Reliable and certified vendors make us different from others. Client centric approach, Competitive price range and Total client satisfaction are the plus points of our organization. We offer a splendid range of Bag, Curtain and Stainless Steel Curtain Eyelets. Our Bag, Curtain and Stainless Steel Curtain Eyelets are best in the industry amongst others. We offer MS Curtain and Curtain Ring Eyelets that are widely appreciated in the market. Advance Brass Curtain and Belt Eyelets offered by us are acknowledged for their functionality. Along with that we offer Grommet Eyelets and Eyelets for Ladies Bags that are a class apart. We also provide Stainless Steel Eyelets for Curtains and Grommet Eyelet for Window Curtains that are extremely reliable.